Attorney-at-Law, Jerome Khan and Business teacher at Bishops’ High School, Coen Jackson. Alleged sexual misconduct by a Bishop’s High School teacher is now in the hands of the Guyana Police Force after a former female student detailed her “emotional” encounter to investigators. 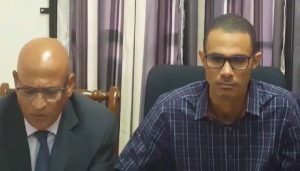 “In the case of the Bishops’ High School teacher, Mr. Coen Jackson, the Ministry of Education Welfare Department in collaboration with the Ministry of Social Protection concluded its investigation and handed the matter over to the Guyana Police Force,” the Ministry of Education said in a statement. Head of the Criminal Investigations Department, Assistant Commissioner, Paul Williams told Demerara Waves Online News Jackson has not been arrested but “in case of anything we will have to bring him in for questioning”. Jackson has already bluntly denied the accusations and has said he has evidence to show that Cultural Policy Advisor, Ruel Johnson has been targeting him because he had been in contact with a female with whom Johnson now has a relationship. Johnson has not commented on that. Sources said more alleged victims could come forward in the days, following the “emotional” disclosure by one the girls while she was a student at Bishop’s High School, historically regarded as one of Guyana’s premier educational institutions. Meanwhile, that school’s Headmistress, Winifred Ellis is expected to be reprimanded after Minister of Education, Nicolette Henry and other top officials of the school’s board and the Parent- Teachers Association listened to a recording in which the educator blamed female students for making themselves vulnerable to males. “At the consultation, a recording of the Headmistress’ address to the students was presented and the Head Mistress had an opportunity to provide an explanation. Based on the evidence presented and the explanation proffered, the committee found the Headmistress culpable of breaching the regulations under the Education Act 39:01 section 35 “Inappropriate behavior by teachers in school” which is liable to a first warning,” the Ministry of Education said. Those decisions were taken when the Minister of Education met with the committee tasked with the handling of the matter. The team comprised of the Chief Education Officer (CEO) Mr. Marcel Hutson (Chief and final arbiter), Legal Advisor to the Ministry of Education- Ms. Kelly-Ann Payne-Hercules, Guyana Teachers Union Representative Mr. Lance Baptiste, President of the Bishops’ High School Board Mrs. Ruth Lee, President of The Bishops’ High School Parent Teachers Association (PTA) – Mrs Sondra Lowe, National PTA Co-ordinator- Ms. Nadia Hollingsworth, Co-ordinator of Health and Family Life Education (HFLE)- Ms. Coleen King-Cameron and the two Head Prefects of the Bishops’ High School. The accusations against Jackson were formally made in Johnson’s letter to the Chief Education Officer about one week ago.